CNET writes LaCie added the CloudBox to its lineup, a cloud storage device that combines 100GB local network backup and online backup functionality into one product. Pricing is pretty high though, the MSRP is $200 and after that you pay $100 per year for the cloud storage functionality. Essentially, this is a small NAS server that you connect to your existing network. Included software will then automatically back up important files of your choice from your computer to the device. As this is done locally, it takes much less time than when you upload it directly to the Internet. 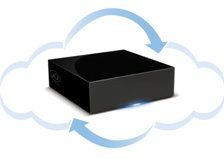 The CloudBox then will upload its content to LaCie's online storage service, by itself. This allows users to operate the computer like normal while still having a online backup solution. LaCie is aware that it takes a long time to upload a large amount of data via the Internet; it optimizes the CloudBox for those who want to back up important information and limits its storage to just 100GB. Still, this is quite a large amount. To put it in perspective, if you have a full T1 upload connection (1.5Mbps), which most of us don't, it'd take about a week to finish uploading the entire 100GB of data. And that's if the connection is used only for the uploading job. In real-world usage, the actual time for the upload with this connection speed would be somewhere between 30 to 60 days.